Plantar fasciitis is no fun to deal with. You have arch and heel pain first thing when you wake up in the morning, pain while walking, and feet that just feel weak and tired all the time. Such a measly pain can really make your days somewhat miserable. Luckily, there are ways to help ease the pain of plantar fasciitis, and it begins with something as simple as finding the right pair of shoes. So, in this article, I’m excited to share with you the best shoes for plantar fasciitis – for running, walking and every day wear. Are you ready? Then, let’s begin. Plantar fasciitis is caused by straining of the plantar fascia, a flat band of tissue that connects the heel bone to the toes. This band supports the arch, and if it’s strained, it can cause tiny tears in the ligament resulting in painful, weak, and swollen arches. This tearing can happen to people with either high arches or flat feet. Plantar fasciitis can be caused by walking, standing, or running for long periods of time, especially barefoot when there is no shoe supporting the arch and foot. It can also be caused by over-pronation, the inward roll of the feet adding unnatural pressure on the arches. People who are overweight or over 40 are more likely to experience plantar fasciitis as well. Shoes for plantar fasciitis help relieve the pressure off the arches and should support the healthy structure of the foot. Good shoes for plantar fasciitis have good lateral support, arch support, and structural stability. Many people with plantar fasciitis will have their own orthotic inserts that they like to put in the shoe which helps with arch support, so it is important that the shoes have removable insoles. Many shoe brands exist to help create the best shoes for the wide range of foot types, including those of us with foot ailments like plantar fasciitis. Some are better than others in terms of shoe structure, design, and, most importantly for us, overall support. Here are some of the best shoe brands that are known for making quality shoes that are good for people with plantar fasciitis. ASICS is one of the top athletic footwear brands for dedicated runners. ASICS is an acronym for the Greek saying, “Anima Sana In Corpore Sano”: A sound mind in a sound body. ASICS really stands by this philosophy by creating shoes backed by sound research done at their Research Institute in Kobe. The Institute is complete with research facilities and gyms which test out every product. Their key features include anti-overpronation and shock-absorption systems. New Balance was founded in 1906 as the New Balance Arch Support Company. They began creating arch supports for people with foot problems. Currently, they continue to make shoes for people with non-standard foot sizes and widths. Their shoes are all made in the U.S. Their shoes are characterized by gel inserts, heel counters, wider widths, and roomy toe boxes. Probably the best-known shoe brand in the world, Nike began as Blue Ribbon Sports in 1964, and became Nike in 1971. They make a variety of different types of shoes including running shoes, basketball shoes, soccer cleats, and fashion sneakers. Nike sponsors many high-profile athletes and sports teams. Skechers is similar to New Balance in its focus on creating quality shoes that are good for your feet. They are the second largest athletic footwear company in the U.S., and began by making utility-style boots and skate shoes. Now they create a variety of athletic performance shoes and every day leisure shoes. Wearers of Skechers love the comfortable feel of their signature memory foam insoles. Plantar fasciitis shoes can be immensely beneficial in the healing process. They can keep you up and moving and allow you to continue your daily activities without unnecessary pain. The help of my own plantar fasciitis shoes has helped my plantar fasciitis pain disappear, so I want the same for you! Therefore, we will now get into the list of the best plantar fasciitis shoes. Since your life is not made up of only one kind of activity, I’ve separated the list of shoes into categories of running shoes, sneakers, and walking shoes. You’ll be able to find out what are the best shoes for plantar fasciitis that can help you live your full life. Although plantar fasciitis can be caused by excessive running, those who are runners don’t wish to quit because of a measly pain in their feet! You may have developed plantar fasciitis from running in the wrong shoes in the first place. Well, we’re here to change that and get you into some supportive shoes that will keep you running and those endorphins flowing. Below you’ll see the top running shoes for plantar fasciitis that will keep your feet supported and well-cushioned to avoid that pesky heel pain. The best running shoe for plantar fasciitis is the ASICS GEL-Venture 5. This shoe always receives rave reviews and praise for their comfort level and durability. 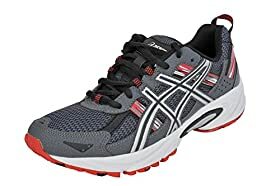 ASICS has some great signature shoe technologies that make running especially enjoyable, even for people with arch and heel pain. The first signature shoe technology I’ll mention is their rearfoot GEL cushioning system. This special insole helps absorb shock and allows for a smooth heel-to-toe transition. The sock liner can be removed to accommodate your own orthotic as well. 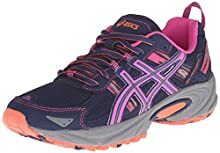 The outsole is also made especially for runners with their ASICS High Abrasion Rubber (AHAR) and reversed lugs to provide plenty of traction on any type of terrain. These shoes provide great arch support and stability which is why runners with plantar fasciitis love these shoes. They are also well-cushioned and lightweight, both really important for the amount of impact endured while running. While some say the toe box is roomy, others claim the shoe to be rather narrow. It’s best to try these on in an ASICS store to ensure correct size and fit. Nike Frees are popular for their stylish minimalist look, but they’re also great for avid runners. The Free 5.0’s come in a variety of colors from bright orange to black and make for extremely comfortable running shoes. These shoes are made with a sock-like, slip-on fit with a textured mesh full inner sleeve. This means easy on and off, i.e. convenience for you. The asymmetrical lacing system is purposeful: it helps reduce pressure from the top of the foot. The diagonal cuts through the arch encourages the natural motion of the foot and helps increase foot strength. You’ll also be able to add your orthotics into these shoes for extra support. The Nike Free 5.0’s are lightweight so you can move quickly. They are well-ventilated as well so your feet will be able to breathe easily. Nikes are known for being narrower, so these shoes are better suited for people with narrower feet and high arches. Trying on in store will ensure correct size, but as a general rule, it seems that going up half a size in these shoes seems to do the trick. Don’t fret if the shoes fit pretty snug at first. They stretch after the first couple of uses to form nicely to your feet. These Nike shoes for plantar fasciitis are a great option for those who enjoy training and running. 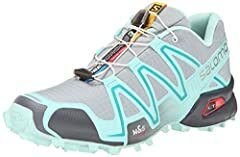 My personal favorite in this list of running shoes, the Salomon Speedcross 3 is a beautiful trail runner that is up to the test of any rough terrain or trail. Besides being able to stand up to some intense trails, they offer comfort, stability, and fantastic arch support. These are some of the best athletic shoes for plantar fasciitis available. The upper is made water and debris-resistant and made with Salomon’s Sensifit technology. Sensifit creates a cradling sensation to the foot making the shoe feel like a glove all around. An Orthalite insole can be removed to accommodate your own orthotics. The dual-density EVA midsole helps to absorb shock and add cushioning. Like the Nike Frees, these shoes may feel tight at first, but stretch with your foot as you wear them. Their Contragrip non-marking rubber outsole has traction lugs that are able to grip through terrain like mud and snow. A protective rubber toe cap also adds some much-needed protection on those rough trails. From the sound of it, you can probably tell that this shoe is well structured and well-protected. This, unfortunately, means they also don’t breathe very well. Light socks should help alleviate this problem. You can choose from a variety of colors from bright to neutral. These shoes are known for being comfortable and lasting a long time. It is advised to not wear these on smooth surfaces like pavement as the lugs may wear out quicker. When you’re not running or working out, you need a pair of shoes for hanging out with friends, running errands, and any other leisure activities that you enjoy that are outside. Therefore, you’ll want to consider some regular sneakers for your plantar fasciitis. New Balance makes some of the most comfortable shoes for plantar fasciitis available so it’s no surprise that they’ve made this list. This training shoe offers great support in the arch and throughout the foot. The wide range of sizes available means anyone will be able to find a size that fits them. The supportive internal shank and shock absorbing ABZORB technology pairs to create great arch and heel support. This helps alleviate pain from plantar fasciitis. These shoes are very supportive through the upper and sole of the shoe. The shoe is made with a sturdy construction which some may find inflexible or constricting. But for those of us who need help with the structural alignment of our feet, these shoes are perfect. Since they are made with the sturdy construction, some may find that these shoes aren’t the most well-ventilated. This is somewhat of a give-and-take for these shoes. Lightweight socks help this issue. These shoes are highly recommended for those with weak ankles and over-pronation. They come in a variety of neutral colors, colors that will match with almost any outfit that you put on. I love the simple traditional sneaker design; the white with pink detailing is my favorite. Saucony brings us their classic, retro-style sneaker: The Jazz Low Pro. These shoes come in a plethora of color options to fit any personality and outfit. They make for a great lightweight pair of sneakers that still offer comfort and support. The Jazz Low Pros are made with slim-fitting nylon and suede upper for a nice soft feel. The classic lace-up ties are accompanied by a padded collar and tongue for all-around comfort on the ankles. A low-profile EVA midsole helps to absorb shock without making the sneakers heavy. The textile lining and cushioned insole makes every step feel like walking on clouds. You can easily change out the insoles for your orthotics. Since these shoes are made with softer materials, they require no break in time. Wearers rave about how comfortable they are right out of the box. Don’t let the “softness” factor fool you into thinking that these shoes can’t hold up in the arch department. There’s a reason they’re on this list! They offer good arch support for being so flexible and comfortable. If you’re looking for a stylish, supportive number, you’ll want to look into these Saucony’s. These Skechers shoes for plantar fasciitis offer great lightweight support in a sturdy lace-up sneaker. These are a great pair of plantar fasciitis women’s shoes offered by Skechers. 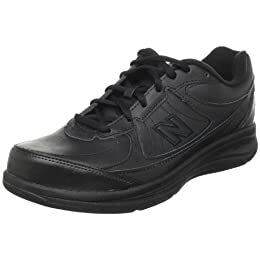 Similar to the New Balance sneakers mentioned earlier, these shoes are structured to give your feet the help they need to stay healthy and strong. A cushioned midsole keeps every step soft but firm. The two-tone heel pull helps with easy on and off convenience. The tongue and collar are padded too give you all around comfort. 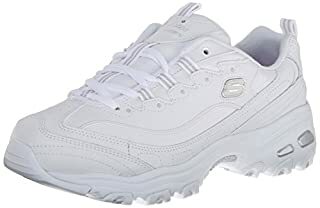 Skechers is known for their signature memory foam insole. This insole is super soft and what every Skechers wearer usually loves most about their shoes. This is paired with a thick midsole which helps absorb shock and provides much needed support through each step. These shoes come in wide sizes and have roomy toe boxes. This is a great relief for those of us with wide, flat feet. For being so sturdy and strong, these shoes remain lightweight and don’t weigh you down when you wear them. 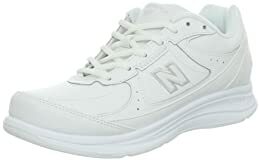 The only negative may be that, like the New Balance trainers, these don’t seem to breathe that well. It seems like ventilation is a tradeoff for added support. They come in mostly neutral colors with a couple of brighter colors to choose from. Many people love the style of these shoes and always talk about how many compliments they receive about them. 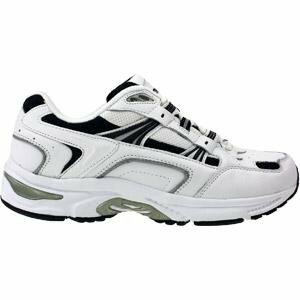 In the men’s department, we have the Skechers Sport Men’s Equalizer. This is a slip-on sneaker that is known for its comfort and convenience. You probably wouldn’t expect a slip-on shoe to be part of the list for best walking shoes for plantar fasciitis, but these slip-ons live up to the challenge. 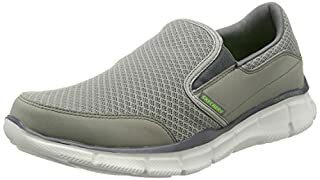 These slip-on shoes are made with mesh overlays on the upper allowing for plenty of air to pass through, a feature that was missing on the women’s Skechers D’Lites. The padded collar feels nice around the ankle. The elasticized goring at the entry makes for easy slip-on. The insole is also made with Skechers signature memory foam. Men do not have to miss out on those top-quality comfort levels. Many find that these shoes are supportive without being constrictive, something that some people might say about the women’s D’lites. They are comfortable and lightweight, making them great for summertime wear. You could even wear them without socks. The consensus is that these tend to run large, so you might want to size down. The Equalizers come in neutral colors of black and brown. If you’re looking for more color options, you may want to look elsewhere. For a simple slip-on that will match with most outfits, these colors work well. Our last section of good shoes for plantar fasciitis will cover walking shoes. For those days when you’re out at the park, the mall, amusement park, or a day trip with friends, make sure you have comfortable shoes that will be able to stand up to long hours on foot. Longevity and comfort are key here. Skechers Go Walk 3’s are popular walking shoes because they are extremely comfortable and convenient to wear. They come in a variety of colors for you to choose from, as well as many of Skecher’s signature features. The Fitknit mesh fabric upper keeps the shoes well ventilated and form-fitting. Memory foam lines the inside of the shoe for that nice cushion as you walk. They’ve even added extra foam padding around the heel for an even cozier experience. An antimicrobial sock liner helps prevent bad odor and can be removed so you can insert your own orthotics. A Resalyte midsole offers great shock absorption and cushioning support. GOimpulse and GOga Pillar sensors offer flexibility and feedback. You’ll be better able to feel the ground underneath you and walk accordingly. 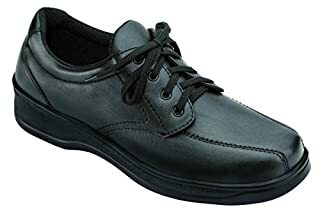 People who wear these shoes always talk about how comfortable they are. Many people have multiple pairs for on-the-go. They are true to size, and fit nicely around the foot. Although the upper is meant to stretch easily over the top of the foot, some may find that the upper is tight. 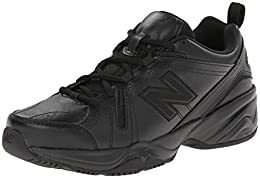 New Balance came out with another winner in their WW577 Walking shoe. This shoe is made in all leather with a simple, traditional sneaker design. It comes in only two color choices, white or black. These shoes are made with the special ABZORB cushioning and replaceable insoles. The collar is padded for added comfort. They offer ample structure for people who have problems with over-pronation. Wearers of this shoe will love the support they provide. This shoe has a wider toe box and a narrower heel. The wide toe box also means more room for wide, flat feet or foot ailments like bunions. These are definitely some of the best shoes to help while recovering from plantar fasciitis. Some may find these shoes a bit on the heavier side, but that’s a tradeoff for the amount of support and structure that you’ll experience. For all the positive benefits, it’s hard to believe that a little extra weight could be the real deal-breaker. 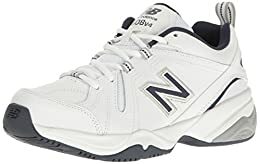 If you’re looking for something basic to get the job done and feel great on your feet, these New Balance shoes for plantar fasciitis might just be the ones you’ve been looking for. We end off the list with a couple of lesser-known shoe brands, but ones known for making shoes for men with foot ailments. This one is Vionic who offers men’s shoes for plantar fasciitis in the Orthaheel Technology Walker. These shoes are great for those with plantar fasciitis because of the added contoured orthotic footbed in the shoe. A deep heel cup helps stabilize, support, and realign the foot back to their natural position. A firm thermoplastic heel counter also helps with stability. There is no shortage of support with these shoes. The breathable, moisture wicking mesh lining keeps the shoes well ventilated while also reducing friction on the foot. The upper is made with water-resistant leather. The tongue and collar are also cushioned for added comfort. The EVA midsole helps absorb shock, and the rubber outsole is flexible, so it moves with you. These shoes are practically perfect for men with plantar fasciitis. The only thing men might have a gripe with is the style. The shoe itself looks like a traditional sneaker, but the shoe name “ORTHAHEEL” is added to the front of the tongue. Some men may not want their foot issues announced to the entire world when they walk. Some men may experience some sizing issues, so you may want to try some on in-store. As a word of caution, some men have also found some durability and quality issues with these shoes. Ending off the list of top shoes for plantar fasciitis is a pair of Orthofeet shoes for women. Like the Vionics mentioned above, these shoes are made specifically for women with foot ailments like plantar fasciitis, high arches, flat feet, bunions, and the like. They are made with a contoured orthotic insole with anatomical arch support. The insole is also made with a gel-padded heel-seat that also contours to your foot. Of course, you can remove them to insert your own orthotics, but I think the point of these shoes is that you don’t have to! They’re already included which is a huge plus in my opinion. Soft seam-free interior lining that’s been padded with foam makes for extra cushioning not just underneath but around the foot. The sole is lightweight with air cushioning which makes every step feel light and airy. The non-binding upper keeps the top of the foot comfortable. The toe box is nice and roomy to allow for space for your toes to wiggle. Perhaps these aren’t the most fashionable shoes. They also only come in neutral colors of white, black, and eggshell. For work and utility purposes where fashion isn’t the objective, these shoes are perfect. All around, these shoes are made ergonomically sound. Women love the comfort and support they get from wearing these shoes. I think you will too. If you’re in the market for some shoes to help ease your plantar fasciitis, you go into your search knowing that you’ll need to look for certain features. These features will help support your foot and improve your overall quality of life. This is not something to take lightly! Here are some tips on how to find good shoes for plantar fasciitis. Probably the most important factor when looking for shoes for your plantar fasciitis is making sure that they provide ample support. People with plantar fasciitis tend to have weaker feet due to over-pronation or excessive standing, exercising, or running. We have feet that roll inward on the arches, or too much weight bearing down on our feet, causing that strain and tears in the ligament that helps hold our arches up. For this reason, we need some extra help from our shoes. They should be structurally sound and offer lateral as well as medial support. Some people may find they need more support than others. Perhaps your arches need more help at the bottom than over top. If this is the case, you could go for shoes like the Saucony’s. For more structure, I’d go for sturdy New Balances or Skechers’ type shoes. All shoes will have their own insoles in their shoes that offer standard arch support. Many people with plantar fasciitis will need to be able to insert their own orthotics- whether store-bought or custom-made- into their shoes. That’s why it is important to make sure that any shoe you buy has a removable insole. Some shoes like the Vionics and Orthofeet options will have specially designed orthotic insoles made for the shoes. These brands are focused on people like us who have these issues, and make the “custom insole” process easier for us. For the most part, you’ll probably have your own inserts that you’ll put into any pair of shoes that you buy. Ankle support is extremely important, especially for those of us who over-pronate. This is, again, where a sturdy shoe might win over a less sturdy shoe. This has to do with the design of the shoe. A good insole and midsole will give you feedback as you walk and help you distribute your weight evenly across the foot. This will help take the pressure off the arches which is where most plantar fasciitis pain resides. Good shock absorption is especially important for people who engage in high-impact activities such as running. Plantar fasciitis can be a real pain, but it doesn’t have to ruin the rest of your days. A good pair of shoes and some supportive inserts are all you need to get back on your feet. I did it, therefore, so can you! 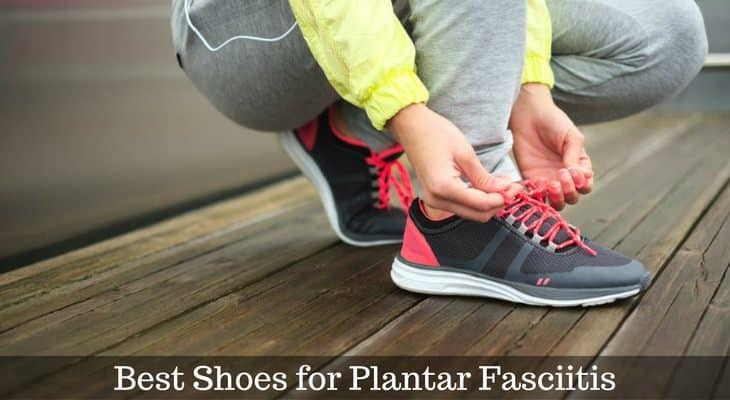 This comprehensive list of plantar fasciitis shoes will hopefully help you to decide which shoes to buy to help ease your plantar fasciitis pain and get you moving once again. I’m pretty sure I covered most of the bases in terms of settings where you might need to wear shoes in your day-to-day life. I wish you the best of luck in your healing process and hope to have helped you find your next pair of shoes.